Who decided not to split infinitives? With whom should we take issue if in fact, we wish to boldly write what no grammarian hath writ before? 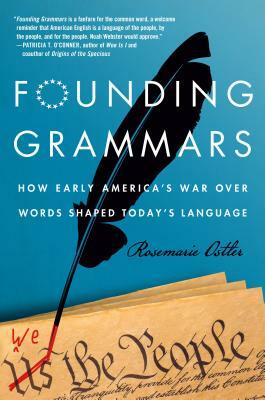 In Founding Grammars, Rosemarie Ostler delves into the roots of our grammar obsession to answer these questions and many more. Standard grammar and accurate spelling are widely considered hallmarks of a good education, but their exact definitions are much more contentious - capable of inciting a full-blown grammar war at the splice of a comma, battles readily visible in the media and online in the comments of blogs and chat rooms. With an accessible and enthusiastic journalistic approach, Ostler considers these grammatical shibboleths, tracing current debates back to America's earliest days, an era when most families owned only two books - the Bible and a grammar primer. Along the way, she investigates colorful historical characters on both sides of the grammar debate in her efforts to unmask the origins of contemporary speech. Linguistic founding fathers like Noah Webster, Tory expatriate Lindley Murray, and post-Civil War literary critic Richard Grant White, all play a featured role in creating the rules we've come to use, and occasionally discard, throughout the years. Founding Grammars is for curious readers who want to know where grammar rules have come from, where they've been, and where they might go next. ROSEMARIE OSTLER, a linguist and former librarian, enjoys delving into the rich record of American usage and word invention. Her books about slang and word origins explore the colorful turns of phrase in America's past lexicon. Ostler's articles have appeared in The Saturday Evening Post, Whole Earth, Christian Science Monitor, Verbatim, Writer's Digest, and Entrepreneur.com among others. Rosemarie lives in Eugene, Oregon.